This document was issued in New Bedford to the whaling ship Porcia, which was under the command of Ruben Ray. The vessel was heading from “New Bedford bound Pacific Ocean a Whaling Voyage” with “provisions and stores for the whale fishery”. Early in his career, Ruben Ray was serving as mate in the brig Potomac of Boston in 1815 when the eleven black crewmen mutinied. Records of the Massachusetts Supreme Court record that the two ringleaders, Richard Taylor and Robert Smith were caught and tried. Smith faced a charge of assault “with a certain dangerous weapon, to-wit, a car- penter’s adze” with “his malice aforethought to kill and murder, and other wrongs to the said Ruben Ray.” The men admitted their guilt and were sentenced to three years hard labor. This sea letter/ship’s passport is in four languages: French, Spanish, English and Dutch. 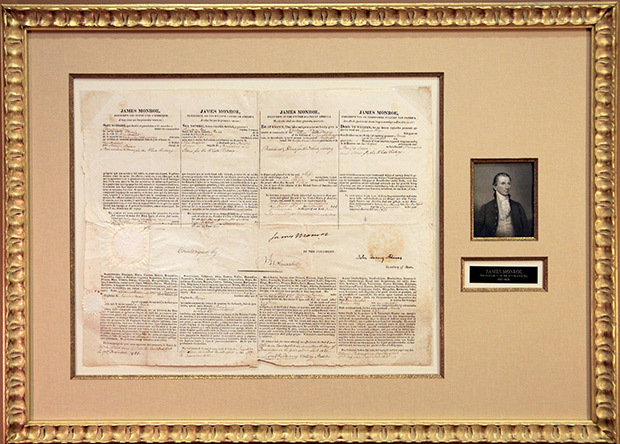 It is signed by President James Monroe who served for two terms from March 4, 1817 until March 4, 1825 after serving as Secretary of State under James Madison. As President, after addressing the sensitive issue of slavery with the Missouri Compromise, he focused on the independence and sovereignty of the American continents, with what became known as the Monroe Doctrine. It asserted that, in South America, Spain should not attempt to regain her former colonies and, on the Pacific coast, Russia should not encroach further south on the Pacific coast of North America. The American continents were “not to be considered as subjects for future colonization by an European Power.” The sea letter is also signed by Secretary of State John Quincy Adams who was uniquely qualified for his position. He had diplomatic experience from the age of 27, with appointments by Presidents Washington, John Adams (his father) and James Madison. He headed the commission that negotiated the Treaty of Ghent to end the War of 1812. He served as a U.S. Senator and then Secretary of State from his appointment on March 5, 1817 until March 3, 1825, the day before he became President. He later served in the U.S. House of Representatives. He came out of retirement to defend the slaves who had risen up and taken control of the Amistad, when that case went to the U.S. Supreme Court. Another signer of the passport was John Hawes, Collector of Customs for the Port of New Bedford. Hawes was active as a shipmaster and owner, a shipping agent in France, and a ship builder, all of which was good experience for him as Customs Collector. He was appointed by President Madison in 1814 and served until his death ten years later.